The 1998 embassy bombing in Nairobi, Kenya – Elvis was there. The 2010 Haiti earthquake – Elvis was there. The protracted, violent conflicts in Afghanistan, Iraq, Somalia, South Sudan and Congo – Elvis was there. The 2014-2015 Ebola outbreak in West Africa – Elvis is there. Elvis Ogweno is the man you want by your side in a crisis. Trained as a Tactical Combat Paramedic in remote search and rescue, rescue under fire, personal security detail and advanced emergency medical and trauma techniques, he signed on with International Medical Corps in August 2014 to lead an ambulance team designated for transporting both suspected and confirmed Ebola patients and blood specimen in Liberia. No matter where, no matter what the conditions, Elvis had devoted his life to responding to conflict zones, natural disasters and disease outbreaks. Elvis coordinates a pickup via ambulance of a suspected Ebola patient. 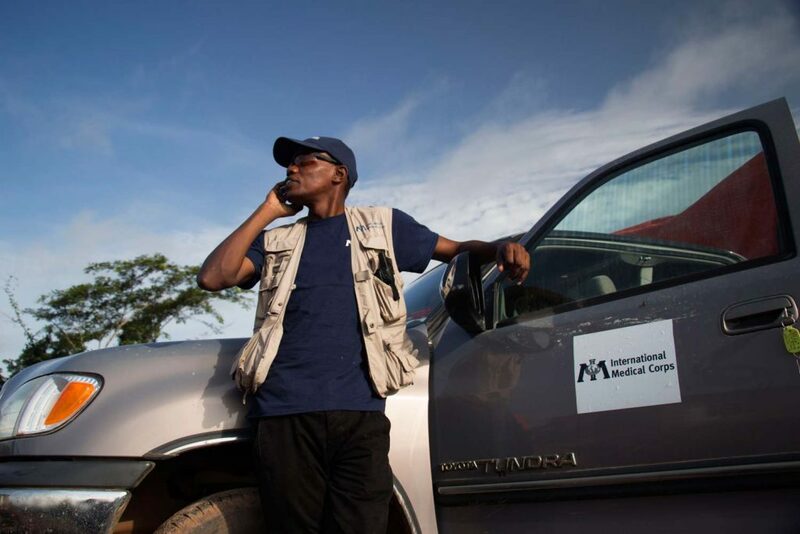 Almost one year later, Elvis is continuing the fight against the outbreak by leading the Ebola rapid response team for International Medical Corps in West Africa. His team can travel via helicopter to the most remote villages with sick people who cannot get treatment. In these villages, he and his team can set up a rapid isolation unit within two hours in order to isolate the suspected patients and keep the rest of the village safe from infection. Like his famous rock ‘n roll namesake, Elvis was inspired in his life’s work at a young age. At the age of nine, Elvis joined the St. John’s Ambulance Club at his primary school in his home town of Mombasa, Kenya. He attended a class every day at the club, learning basic first aid skills. He even participated in first aid competitions with other clubs around the country. After graduating from high school, Elvis was a volunteer with St. John’s Ambulance in Nairobi in 1998 when the US Embassy was bombed. Elvis and his team spent the next four days rescuing many people with severe injuries. His efforts were noticed and he was chosen to train as an emergency medical technician, a nine-month course sponsored by International Medical Corps. From there, Elvis continued his training in emergency medical systems in South Africa, Switzerland, and Italy and at the Rocky Mountain Institute in Denver, Colorado and the Israeli Security Institute (IMS) in Los Angeles. He then went on to put his skills to use as an EMT/Paramedic in Afghanistan and Iraq and an emergency remote search and rescue diver in Democratic republic of Congo. In Haiti following the 2010 earthquake, Elvis worked with the local government providing medical evaluations to new police officer recruits. From Haiti, Elvis traveled back to Kenya to work with the Kenya Red Cross to help establish the first all inclusive emergency response system (EMS) in the country. Since the summer of 2014, Elvis has been in West Africa fighting the worst Ebola outbreak in history. He admits tackling Ebola is his biggest challenge to date. Despite having rescued wounded people under heavy fire, Elvis was hesitant to take on the role of ambulance coordinator in Liberia to fight the Ebola outbreak. 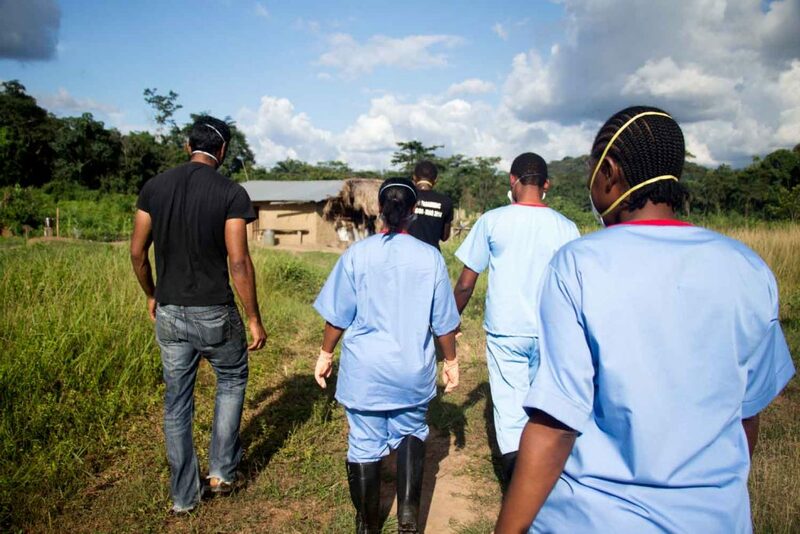 Elvis and his team walk towards the home of suspected Ebola patients. Elvis transported the patients back to the ETU while the team stayed behind to spray the house with a disinfecting chlorine. When the Ebola outbreak was at its height in Liberia, Elvis met a young boy of 12 or 13 named Elijah after a call came into the ETU one day around 4 pm of a sick boy who had been waiting for an ambulance since the day before. Elvis and his team decided it was important to pick up the young patient immediately, even though the call had come past the deadline for deploying ambulance teams because of the dangers of travelling in the dark. The boy had been waiting too long. The team drove five hours to the small village and upon arrival, found that Elijah was displaying classic symptoms of Ebola. 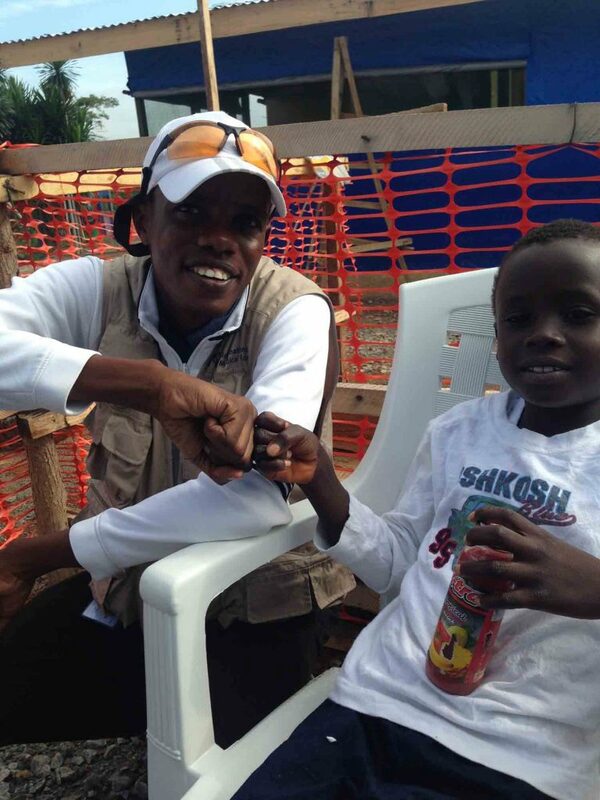 Elvis brought Elijah back to the ETU around 1 am where he later tested positive for Ebola. Elvis and Elijah at the Bong County ETU. Elvis is now based in Guinea-Bissau, a country that shares a porous border with Guinea, and is providing critical training to health care workers on Ebola prevention. He is specifically working in two border regions and in Bijagos – a set of 88 islands off the coast of Guinea-Bissau. Elvis says he will stay in West Africa until the outbreak is officially over. “I’m not done until Ebola is done,” he declares.